Today we were asked by a customer to have a look at his tub as it was leaking. We didn’t sell this customer his tub but on finding out that it was a “Foam Filled” unit, I must say I was reluctant to undertake the repair. Why? I hear you ask, a leak is a leak right? Well for a spa that has very little access issues and has Heatlock or Cavity insulation, your right it’s not a big deal at all. However when your facing a sheet of foam which may be 3ft deep, that is a problem. Where do you start with that repair?. You cant see where the drip is coming from and your cutting into foam not knowing if you might cut through pipes or manifolds that are hidden. Why is this such a problem? Well if the tub is out of warranty you will pay £45 per hour after your call out charge £95 for the engineer to find and fix the problem. A job that should only take 2 hours can become a full day repair or more. Do the maths yourself it could end up costing £455.00 if it’s completed on day one!!! 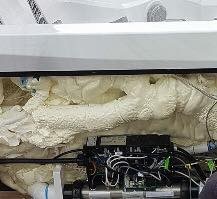 So why do companies use this method of insulating a hot tub. The answer is to reduce the cost of manufacturing. Make the acrylic shell thin, then pack it with cheap foam to support it. This is not a bad way to insulate a hot tub but it causes major issues if your tub suddenly springs a leak. Most engineers don’t want the hassle of working on these units, so be careful when your purchasing a hot tub. 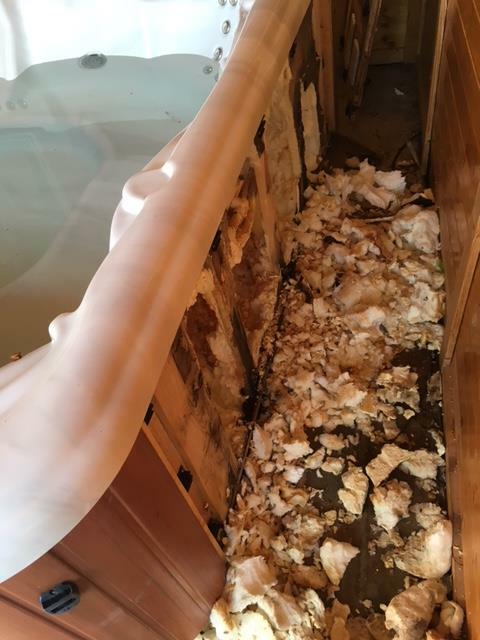 Ask the dealer what kind of insulation their tubs have, that question could save you lots of money and a bit of heartache at some point in the future. Some of the biggest American manufacturers build and insulate tubs this way, so be careful. Big brand names don’t mean your protected from this problem!! !